Considered one of the most useful storage equipment options, pallet racks take advantage of vertical storage space and provide organization solutions. There are many options when it comes to pallet racks, but today we’ll discuss one of the most popular ones: cantilever pallet racks, also known as cantilever storage racks. 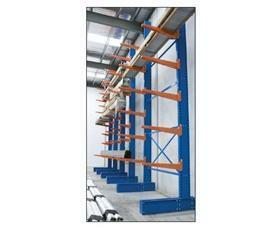 In comparison to traditional pallet racks, cantilever pallet racks have a lot to offer. There are many benefits of cantilever pallet racks in comparison to the traditional pallet rack. Keep reading to learn how this essential warehouse storage equipment can benefit you! All pallet racks are useful, but some offer solutions that may benefit your specific warehouse storage needs more. For instance, their primary and most beneficial use is for storing long materials such as lumber or metal. Flexible and Compact: With a cantilever storage rack system, your load may be stored anywhere along the rack row. In addition, since there’s no front column, more horizontal space is available to you as well as handling clearance. Ease of Use: Compared to their traditional counterparts, cantilever pallet racks can be loaded and unloaded quickly. This is time and money saved with increased efficiency. Adaptability: Nearly anything you need to store will work with cantilever storage racks. In fact, they’re the preferred storage equipment for extra-long or oddly-shaped loads, such as lumber or metal. Economical: Due to being easier to access, you’ll not only save time and money in labor, but also down the road with their adaptability. Cantilever pallet racks can handle any load size or shape, where as traditional racks may need additions that will cost money down the road. While the storage system your warehouse should use depends on your needs, cantilever pallet racks are a popular choice for most applications. Their benefits are extremely useful for a wide range of warehouse storage situations. Think a cantilever storage system is the answer to your warehouse needs? S.W. Betz can help with that. If you would like to learn more about cantilever pallet racks, please contact S.W. Betz by calling 410-574-1414 or 800-332-0322 today! You can count on the S.W. Betz Company to work with you and provide you with our extensive knowledge of the industry. This entry was posted on Tuesday, December 8th, 2015 at 4:00 pm. Both comments and pings are currently closed.